Wow - have you noticed my new blog design? Amazing isn't it! I absolutely LOVE how it turned out! As I grew excited thinking about what I wanted my blog header to "say" when readers or followers stop by - I began to think that maybe an overall design would make more sense. And, at the time, Jodi was having a wonderful sale on her blog designs! So, I replied to her email telling her a little about myself and what I was looking for in a header and blog design - and OFF we went on our wonderful journey! Jodi found some amazing graphics design ideas, "listened" patiently to my likes and dislikes and overall, I believe we came up with a wonderful design that turned out even better than I imagined! Jodi is an absolute Joy to work with. She is patient, understanding and works very hard to make my blog fantastic. 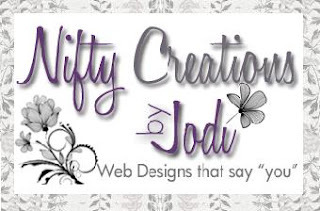 I highly recommend if you are in the need for a blog header, button, some cute social media buttons, help with HTML, or an overall design - check out Nifty Creations by Jodi! You'll be just as satisfied as I am! I'm so satisfied, I plan to have her help with another of my blogs in the near future! Thanks again Jodi for everything! Using elements from Vice Versa from Designs by Krista.